Purpose: Investigation of drug safety signals is one of the major tasks in pharmacovigilance. Among many potential signals identified, only a few reflect adverse drug reactions requiring regulatory actions, such as product information (PI) update. Limited information is available regarding the signal characteristics that might predict PI update following signal evaluation. 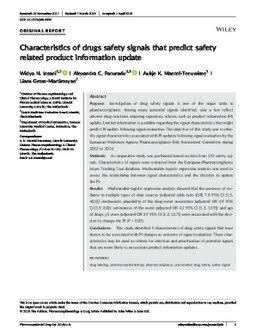 The objective of this study was to identify signal characteristics associated with PI updates following signal evaluation by the European Medicines Agency Pharmacovigilance Risk Assessment Committee during 2012 to 2016. Methods: A comparative study was performed based on data from 172 safety signals. Characteristics of signals were extracted from the European Pharmacovigilance Issues Tracking Tool database. Multivariable logistic regression analysis was used to assess the relationship between signal characteristics and the decision to update the PI. Results: Multivariable logistic regression analysis showed that the presence of evidence in multiple types of data sources (adjusted odds ratio [OR] 7.8 95% CI [1.5, 40.1]); mechanistic plausibility of the drug-event association (adjusted OR 3.9 95% CI [1.9, 8.0]); seriousness of the event (adjusted OR 4.2 95% CI [1.3, 13.9]); and age of drugs ≤5 years (adjusted OR 3.9 95% CI [1.2, 12.7]) were associated with the decision to change the PI (P < 0.05). Conclusions: This study identified 4 characteristics of drug safety signals that have shown to be associated with PI changes as outcome of signal evaluation. These characteristics may be used as criteria for selection and prioritization of potential signals that are more likely to necessitate product information updates.